It’s taken me a while to get to Cthulhu’s Vault for a couple of reasons. 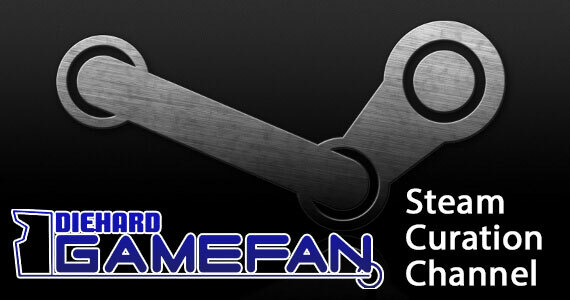 The primary one is that the game is for 3-6 players, a fact that was not advertised in the Kickstarter campaign 1,528 backers took part in. As I only back games that can be played by two players (in case it is just my wife or myself), I found this to be more than a little uncool that Jolly Roger Games neglected this very important detail. In fact, the Kickstarter itself says the game is made for 2-6 players, but the rules and actual finished product only say 3-6. Boo-urns. It also makes getting a review of a game in a lot easier as I don’t have to coordinate with other people to play something for the sake of a writing piece. 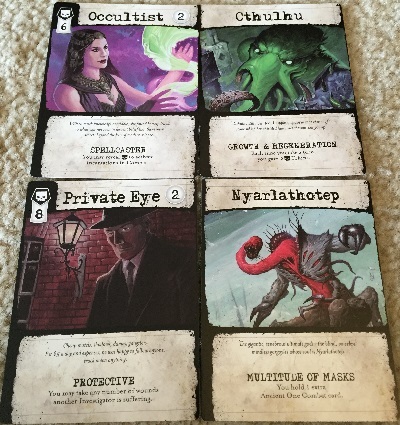 The good news is that Cthulhu’s Vault feels like an update/modernization of Chaosium’s old CCG Mythos. As that was my favorite CCG ever (along with Illuminati), that’s high praise indeed. From the very start, Cthulhu’s Vault oozes with charm. 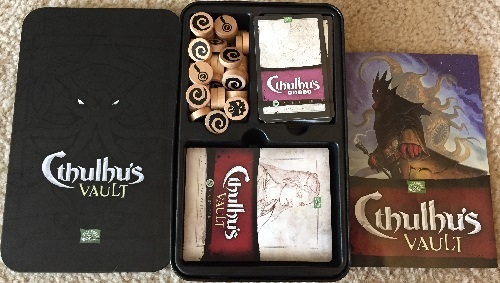 It comes in a snazzy metal tin with the game’s title and a stylistic version of Cthulhu drawn on it. The tin is extremely well made and really makes the game stand out. However, the metal is quite thin, so it could easily be dented and damaged if you’re not careful. Inside the tin, you’ll see that the package is literally overflowing with tokens. The dice you will have to use with Cthulhu’s Vault are buried beneath them. The tokens are real wood, circular in shape with icons painted on each side. You’ll also see two decks of cards – one of which is a standard size and the other which are oversized (more than double standard card size). The bulk of your set up will be break set of cards into three smaller decks. With the oversized cards, you’ll be making a Story Deck, an Ancient One deck and an Investigator Deck. With the smaller sized cards you’ll be doing the same but making a Battle Order deck instead of an Investigator deck. Cthulhu’s Vault is divided into two VERY different stages. 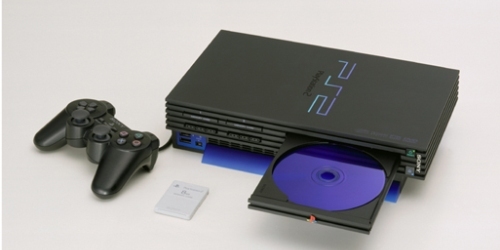 The first part of the game is a co-operative storytelling session known as the Mystery Stage. 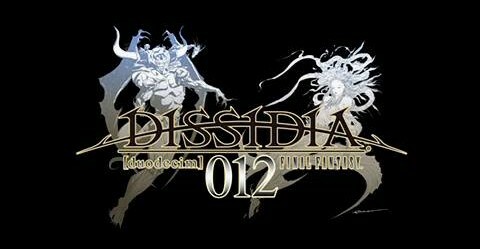 The second part of the game is the Battle Stage, where the game becomes competitive as all the other players must stop the machinations of the one player that has become a thrall of a Great Old One. Now this description sounds a lot like Mythos meets Betrayal at the House on the Hill and it should, because that’s pretty much what Cthulhu’s Vault is –a fantastic mash-up of two very fun games. It is worth noting that Cthulhu’s Vault is about storytelling and ambience rather than “winning.” The creator of the game admits right out that the GOO side will win 75% of the time. The game is heavily stacked in its favor because it is an unfathomable cosmic horror with godlike powers. Of course how many stories by Lovecraft and his contemporaries ended with the protagonists getting a happy ending? Very little. So this percentage is spot on, but it also means if you are playing with people (or are someone) that need to win or treat games as SERIOUS BUSINESS, Cthulhu’s Vault is not the game for them (or you). 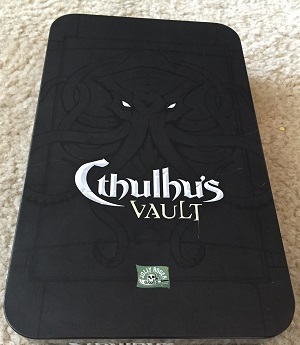 A good rule of thumb is that if you like the aforementioned games or Arkham Horror (whose creator, Richard Launis worked on this), you will probably have a good time with Cthulhu’s Vault. So to begin the game, the eleven card Ancient One deck is shuffled and each player gets a card dealt to them facedown. This Old One will be the one you are trying to awaken as the game goes on. Your choices are Ithaqua, Nyogtha, Keltwald Spirit, Nyarlathotep, Hastur, Shudde M’Ell, Y’golonac, Cthuga, Cthulhu, Yig, and Tsathoggua. Next up you shuffle the Story Deck (it’s massive) and each player is dealt seven cards from it. After each player has been dealt their story cards, the top card of the deck is flipped over and used as the prologue card for the start of the storytelling part of the game. The rest of the Story Deck is then returned to the tin. After that each player is give 1 Investigator Power Token and 1 Cultist Power Token. Keep these. Tokens are double sided so you want the spiral to be face up so other players are unable to see how many tokens you have of each type. Then in the middle of the playing area set eight of each token face-up. These will be the known power pools. The rest of the tokens are then placed face down and used for random draws. The goal is to get enough Cultist/Ancient One Tokens (the names are used interchangeably. Bad Editing/oversight) to summon your Ancient One/Great Old One first. Notice that you haven’t taken an Investigator card yet. In most games you would have picked your PC by now, but that’s not the case with Cthulhu’s Vault. That won’t come until much later. Now begins the Mystery Stage, or the storytelling part of the game. Player one looks at the Prologue Card and then begins to set the narrative. I’ve randomly drawn a card the deck and it is the Tome card. So I have to start a story. So that’s the prologue. Looking at the card, you’ll see several things. In the left hand side of the card there is a colored icon. That tells what type of card it is. In the lower left hand of the card you’ll see the word bonus and an icon. If you have a card in your hand that matches the icon of the top card in the story pile, you get a bonus reward. That reward is in the middle of the card. Finally, each card that you play nets you two tokens. Now you don’t get any cards for the Prologue card. You just have to set the stage with it. As we look at the Tome card we see that you get a bonus for a card that has a Skull icon in the upper left hand corner. Let’s look at the hand I randomly drew for this review. I have seven cards: Clock, Article and Book all have a gun icon in the upper left hand corner. Detective and Author all have a stick figure icon. Dusk has a handprint and Brotherhood has the Skull icon. So let’s go with playing that card to ensure we get the bonus. 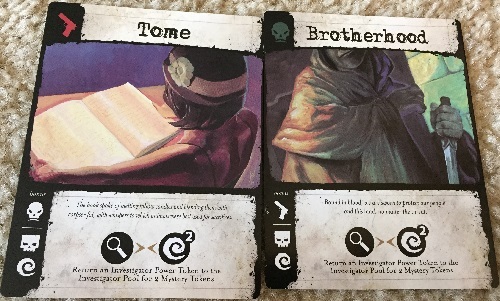 I would then put the Brotherhood card on top of or next to (depending on the size of your playing area) the Tome card and then continue the story telling something about the Brotherhood, most likely making them an evil cult that breaks into the library to steal the Tome. For that I would get the two tokens shown on the lower left of the card – 1 Cultist and 1 mystery draw from the pile. As well, because I played a skull card, I would get the Brotherhood bonus, which would be to exchange one of my Investigator tokens for two blind draws. Now we see that the Brotherhood gives a bonus if someone plays a card with a gun icon. On and on things go until someone has enough Cultist Tokens to summon their Great Old One. If that is the cases instead of playing a Story Card, they reveal their tokens and show off their Great Old One. This then begins the Epic Battle Stage. First you round up all the Story cards and put them back in the tin. They are no longer needed. Now the remaining players are united against the person who summoned the Great Old One. Each of those players gets to look through the Investigator cards and chooses the one he or she wants to be. You have nine options – Curious Student, Bootlegger, Private Eye, Reporter (although the Battle Deck has Journalist which may confuse some. It was an error not caught by the editing team), War Vet, Professor, Reformed Cultist, Faithful Nun and Occultist. Each character has their own Life Total (Hit Points), Hand Size, and Special Ability. You simply pick which one you like the best or who you think will be the most help in the coming conflict. Once these are chosen you discard your tokens down to the number of Life Points your character has. So if you had ten tokens in the storytelling part of the game and your Reformed Cultist has six hit points, you have to dump four tokens. You can keep Cultist, Investigator or a mix of either tokens. Both have their uses. Cultists Tokens tend to be for special abilities and spells, Investigator Token tend to be for physical attacks. You’ll find the Cultists token options to come up more often FYI. Meanwhile the Great Old One Player draws Cultists Tokens equal to the number listed on the Battle Card. So for a three person game, you would get 18 tokens, for a five person game you’d get 20 and for a six player game, you’d get 22. Next you shuffle the Ancient One and Investigator Combat Decks. Each player draws cards equal to the hand size of their investigator and the Ancient One draws three cards. Then you create the Battle Order Deck. Look through the cards and create the deck by taking the card for each investigator and then one Ancient One card for each Investigator. So in a four player game the deck would be four cards – one for each Investigator and two Ancient One cards. Each turn the Battle Deck is shuffled and the order of the cards determines the order of who acts when in this phase of the game. When it is your turn you play a battle card from your hand (hopefully still storytelling with it), inflict damage (if applicable) and then draw up to your hand size. Repeat until either the Ancient One or the Investigators are out of health. That’s the game! 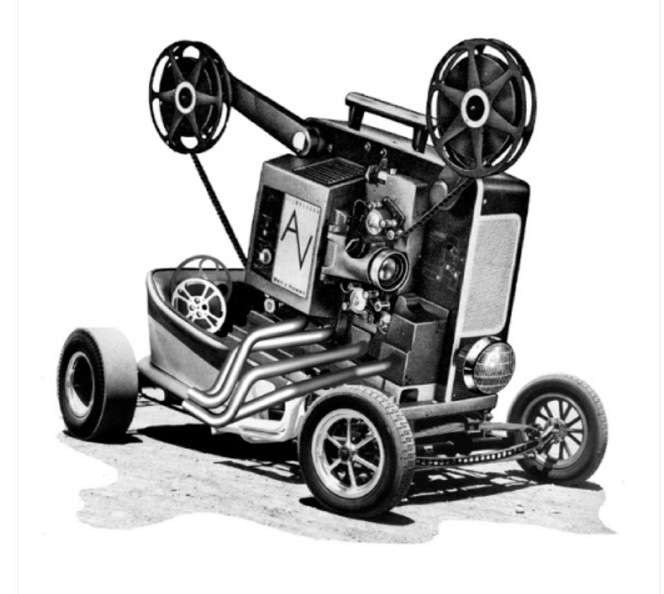 I know the review was a bit dry, but it’s really hard to describe how the game flows. It really does feel like a modern version of Mythos mixed with Betrayal at the House on the Hill. It’s a lot of fun, it inspires a ton of creativity and ambience and it doesn’t matter if you win or lose – everyone has a lot of fun. Cthulhu’s Vault is simply a great game (even if it lacks a two player option) and it’s definitely one of the best board games of 2015. If you manage to find a copy (say at GenCon), you are going to want to grab this up ASAP. It is well worth the price tag. The production values are top notch and it will quickly become one of your favorite games when you have an hour or less to spare. Try and track it down already!